IT spending is one of the most difficult areas of accounting to understand, and despite best efforts on the part of the CIO and the CFO, transparency is difficult to achieve. Understanding the impact of IT spending is even more challenging. Back in the days when all company-wide technology functions were funneled through a centralized IT department, keeping track of technology processes and the spending that enabled them was easy. IT provided the technology that drove business processes throughout the company, and implementation was all in one place. Today, IT functions are dispersed throughout the enterprise, delivered on an as-a-service basis and sourced by line managers without IT`s intervention or guidance. Achieving a high level of financial transparency in IT spending is no longer simply a matter of basic accounting. It requires a more defined process. Technology Business Management (TBM), a strategic framework to drive innovation with cost transparency at its foundation, maximizes the business value of IT spending through better collaboration between IT and the lines of business. Like the practice of Business Process Management (BPM), TBM aims to improve organizational workflow and promote adaptability and agility in an environment that is constantly changing. In the IT department, business methodologies may take a back seat to programmatic approaches to problem-solving, but a pure IT approach (as opposed to a process approach) falls short—often failing to make the connection between the business imperative behind an IT request and the back-room programming designed to solve it. By bringing TBM and BPM into the IT department, the CIO can make the critical and often-overlooked line-of-business link to IT practices. The financial transparency afforded by TBM will effectively determine the real business value of each IT process. Because of the IT department`s unique position in the enterprise and the deep (but often invisible) interconnection that exists between IT and lines of business, simply applying the same financial management tools that are used elsewhere in the business is not enough. Managers must look at IT expenses compared with outcomes and value. A greater level of intelligence derived from benchmarking—a key part of the TBM process—also provides new insights and decision support when it comes time to fund innovation and drive investment decisions for new projects. In addition, the TBM framework reveals each technology process and its business value, both over time and compared with industry peers, so that when budget cuts loom, the CIO knows which services must be reduced. TBM leverages a standard taxonomy created by the TBM Council, a vendor-neutral standards body. The TBM Unified Model, which implements the Council`s taxonomy, standardizes financial information and aligns benchmarking data and thereby reduces the time needed for data collection. It also simplifies historical trending and analysis, provides an ongoing comparison of infrastructure IT costs against industry peers and emphasizes data analytics to allow leaders to focus more on strategy and transformation. Like BPM, TBM is more than just the software an enterprise chooses to deploy. It`s the alignment of that software with strategic initiatives to gain greater visibility to business processes and deeper insight into the business value of IT spending. The combination of TBM technology and process goes much farther than the traditional point-in-time snapshots, delivering, instead, a more dynamic, multidimensional and continuous approach to managing IT costs over the long term. ISG recommends a multi-dimensional framework for implementing TBM. This approach makes IT transformation more strategic, with the key goal of driving re-investment of funds back into technology solutions. The multi-dimensional framework (MDF) includes six dimensions: people, process, strategy, data, analytics and technology. For a true transformation, the dimensions interact in multiple ways with each other. The process dimension in our MDF framework involves implementing methodologies such as IT Financial Management (ITFM) and IT Service Management (ITSM). Traditionally, business process design and execution relies on establishing a framework that primarily leverages human resources to create deliverables, with the support of technology solutions. Today`s approach replaces those labor-intensive components with automation technology to streamline process, enhance the agility of the enterprise and produce quicker time-to-value. However, without a framework with which to manage automation, businesses will struggle to achieve the benefits it promises. TBM is founded on cost transparency, which is the key principle for achieving a new level of IT cost insights. TBM processes represent a framework for cost insights to become action-oriented, rather than just static information. 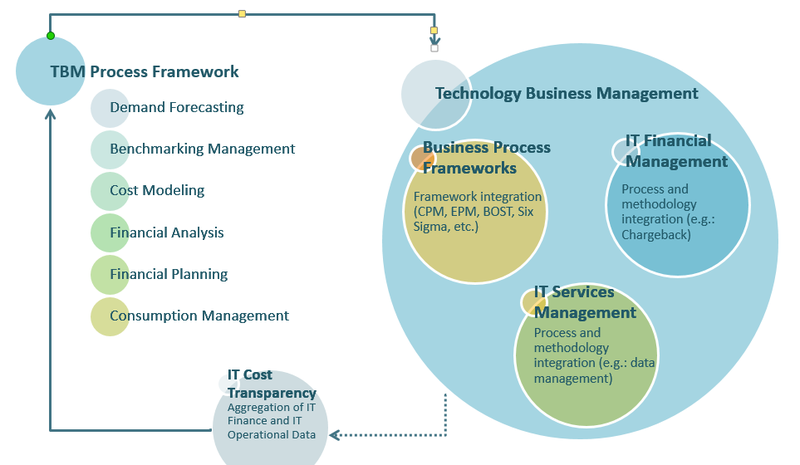 As seen in the figure below, an enterprise that links TBM processes focused on IT Financial Management into its services management framework creates an IT cost data model wrapped in process and governance that is enabling the firm to support strategic business initiatives beyond the scope of the IT department. The process uses insights to create a plan for driving initiatives, funding innovation and reducing costs. In the MDF, process is based on ITFM principles. The first phase involves gaining deeper insights into the relationships between current processes and ITFM and ITSM. The second phase involves understanding how cost transparency drives the TBM process framework. Phase three designs a customized TBM process framework. And phase four is an analysis of how TBM relationships link ITFM and ITSM to drive cost transparency improvements in a closed-loop, process-enhancement cycle. TBM has a big role to play in guiding IT spending and understanding that spend from an enterprise perspective. IT is no longer just a “build and deliver” stand-alone entity; it has a much broader and more organic role to play within the enterprise. TBM, as a complement to BPM, will help deliver a much better understanding of the value of, and interplay between, the technology behind business processes. Alex-Paul Manders is a pioneer in the technology business management (TBM) space. As ISG's TBM Practice Lead for the Americas, he advises ISG's clients on TBM strategy and how to use this methodology to drive value in their organizations. ISG's TBM approach begins with fact-based, analytical strategies, supported by transformational IT initiatives that optimize the IT enterprise by running IT like a business. Alex-Paul has helped many clients use the TBM process, with a focus on transparency, to drive planning, forecasting, and budgeting activities in the realms of finance and IT. Contact Alex-Paul at Alex.Manders@isg-one.com.